TRAWLING THROUGH MY Twitter feed the other day I came upon this photograph by Eugène Atget made in 1898 entitled ‘La Place Saint-Médard’. The original photograph is an 18.1 x 21.9 cm albumen print created from a finely divided silver and gold image dispersed in a matrix of egg white. Albumen prints were the most common photographic printing process from 1855 until around the turn of the nineteenth century. This Atget image chimes with me because I know this area of Paris particularly well, but when I saw the photograph I was struck by two things: First, the title, ‘La Place Saint-Médard’, and second, what did this place sound like in 1898? The title of the photograph, ‘La Place Saint-Médard’ is curious because that name does not exist in this spot today and, so far as I know, it never has. I can quite see why Eugène Atget might have thought that the space he photographed bore that name: It is at the foot of rue Mouffetard, one of the oldest streets in Paris dating back to Roman times and it is adjacent to the Eglise Saint-Médard whose origins date back to the 7th century. The space that Atget photographed does have the attributes of a typical Parisian ‘Place’ but as far as I can establish it is, and in Atget’s time was, part of rue Mouffetard. 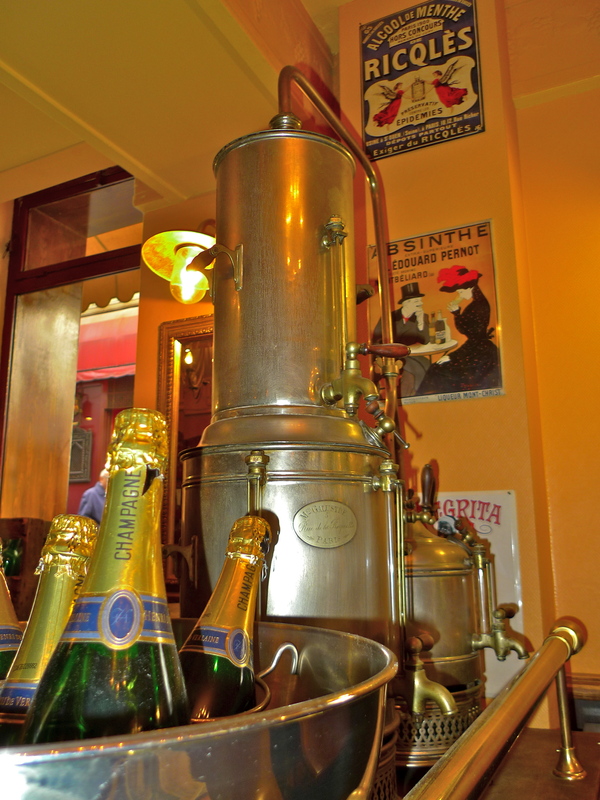 So what did Eugène Atget’s ‘Place Saint-Médard’ sound like in 1898? Thanks to his large-format wooden bellows camera, rapid rectilinear lens and glass plates we know what Atget saw as he stood in this place but we have no record of what he actually heard. And that’s not surprising because for most of our history we have used artefacts, architecture, pictures and words to create a vision of our past. It’s only in the last few seconds on our historical clock that we’ve been able to capture and archive sound, which means that almost all our sonic heritage has passed by completely unrecorded. We could create a late nineteenth century soundscape of this place from our imagination of course and we might not be too wide of the mark, but we cannot create the actual sounds in that place on that day. 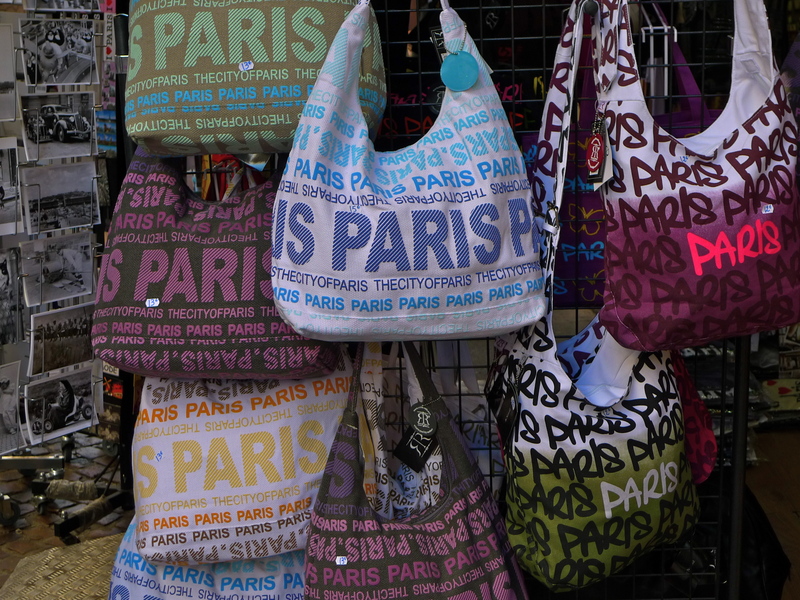 I SPENT A WONDERFUL DAY last week exploring Paris with my friend, Roxanne Escobales. Roxanne is an independent audio producer and journalist who has decided to slowly take the scenic route away from news and into the sound-based, multimedia world. When she isn’t trying to figure out how to persuade people to give her money for her ideas and production, you can find her at her local pub in South London, appreciating the leafiness of Crystal Palace. You can hear her forays into podcasting with Palace Stories (palacestories.co.uk). You just may hear her news production without realising it if you listen to the BBC World Service. During the day, I was privileged to introduce Roxanne to the art of soundwalking – something she took to with great enthusiasm. 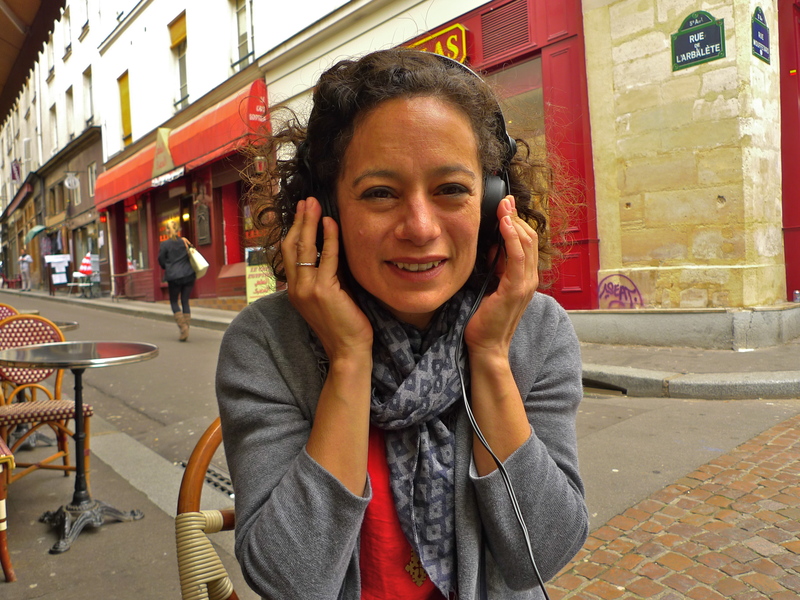 Later, I rather hesitatingly asked Roxanne if she would consider sharing the experience of her first Parisian soundwalk by writing a guest piece about it for this blog. No hesitation on my part was required of course because she readily agreed. 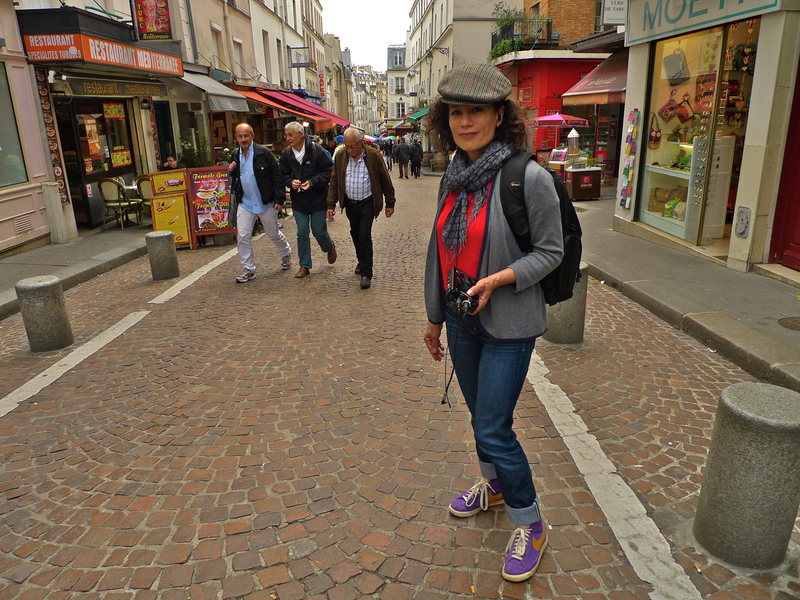 And so it is with great pleasure and with my grateful thanks that I share with you Roxanne’s story about her soundwalk in the rue Mouffetard. Footsteps on my left, laughter just a few meters ahead, and a motorcycle from behind me on the right driving past – watch out! – there’s a car following it and I’m right in its path. My body instinctively tries to move out of the way, conditioned to save itself by merely hearing the sound of an engine over my shoulder, its wheels on the asphalt. But at this point, I’m not walking down the street about to be run over by a two-ton killing machine. I’m sitting at a table outside a café on the rue Mouffetard in the 5th arrondissement in Paris, around the corner and down the street from where Ernest Hemingway lived from 1922-3. I’ve got a pair of headphones on, and through my ears I’m re-living the past 20 minutes in binaural stereo. The sound – panning from left to right, or right to left depending on the relative movement of its source in relation to my head at the time of recording – is so realistic, it’s practically 3-D, as if I could touch it, or, in the case of the car, as if it could touch me. I had just taken a soundwalk with Des Coulam, master of this Soundlandscapes’ blog. He had graciously allowed me to wear his in-ear binaural mics (Soundman OKM II for you knob-twiddling techophiles) to record the whole thing. Honoured, for sure. “Once you listen back to what you’ve recorded, you’ll be transported to that time and place again,” Des told me over lunch before we set out. I hadn’t realised to what extent said transportation would happen. While I was listening, I could smell the whiff of cheese hanging like a fog around the fromagerie that I had long since passed, and I could see the green jumper and blue jeans of the brown-haired boy whizzing up and down the pavement with his blonde friend as they made tooting noises like sirens, their voices long since silenced. This was my fifth visit to Paris, and I’ve been working with sound since 2006, so I am no stranger to either. But I had never taken a soundwalk, and it’s changed the way I use my ears, and the way I interact with and understand the world. I felt like a deaf woman who’s heard her child’s voice for the first time. Before I stuck the mics in my ears, Des tutored me on how to open myself up to the sound of the city – how to acknowledge and distinguish each individual sound instead of filtering it out as a mass of white noise, which is what we normally do every waking moment as we navigate through the aural obstacle course around us. Then he told me that with the binaural mics I was to pretend my head was the mic shaft, and my ears were now microphones. It’s stereophonic, so it captures a pretty full range. Any sound that I was drawn to I was to slowly turn and/or point my head in that direction. Thankfully, he used his vast experience with the technology and set the recording levels for me, because, as they are mics and not headphones, you can’t hear how the machine is recording; you can only hear what’s being recorded. Had I been responsible for the recording levels I would most likely have set them too high or too low. While the result was mind-blowing – those mics pick up quite delicate sounds – the process was an experience itself. 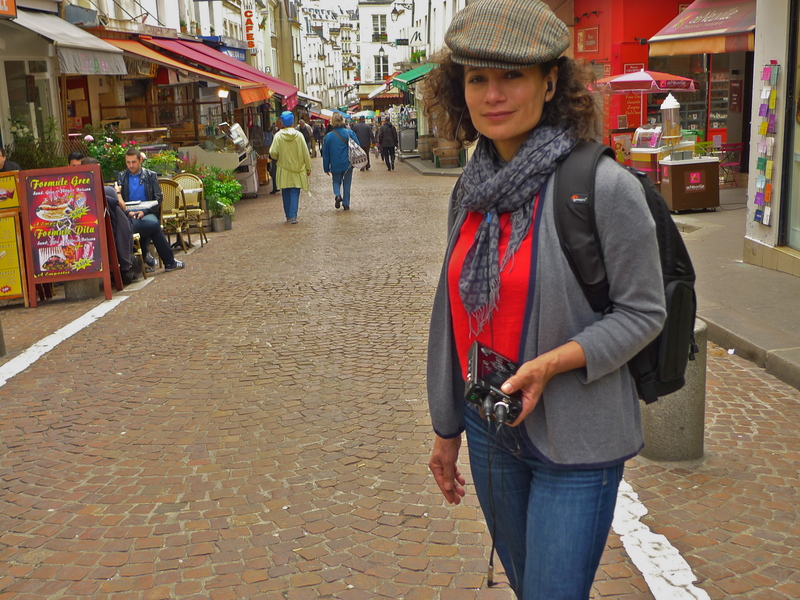 Walking down the rue Mouffetard wearing small earbud mics, I blended right in as it looked like I was just listening to music. Concentrating on the soundscape of the street made me aware of a whole new sensory experience. As a fast walker used to busily-busily hurtling down London streets through annoyingly rambling crowds, thinking about the next ten things on my to-do list and not being present in the now, the soundwalk made me stop and hear the roses. Des has graciously edited down a shorter version of the 23’51” piece I recorded for you to enjoy. It’s only one moment in time and space – MY moment. Because you didn’t experience it you probably won’t have the same sense of wonderment that I did upon listening to it. But clamp on a pair of cans for that full stereo effect, sit back and listen to the life of one street in Paris on a sunny May afternoon, and you may just appreciate that moment, because those sounds won’t happen in that order at that place ever again. This is history in a very personal sense. Maybe, just maybe, it will inspire you to open up your ears and hear the familiar in a startlingly new way. 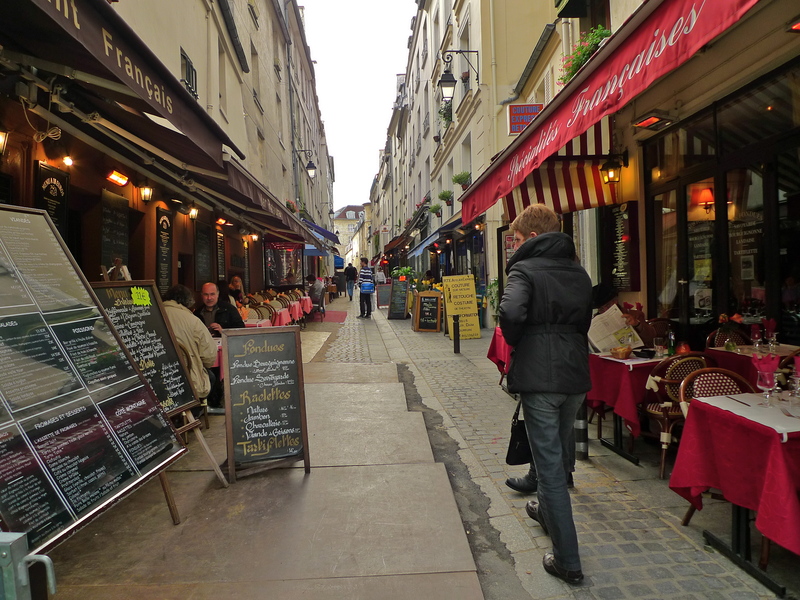 THE RUE MOUFFETARD is a very old Parisian street, a Roman road leading south to Italy. In the eighteenth century the area around the rue Mouffetard gained a reputation for violence and in the nineteenth century men from la Mouffe’ were always to be found on the Paris barricades at every opportunity from 1830 through to 1871. Balzac said that, “No neighbourhood of Paris is more horrible and more unknown”. Times have moved on. 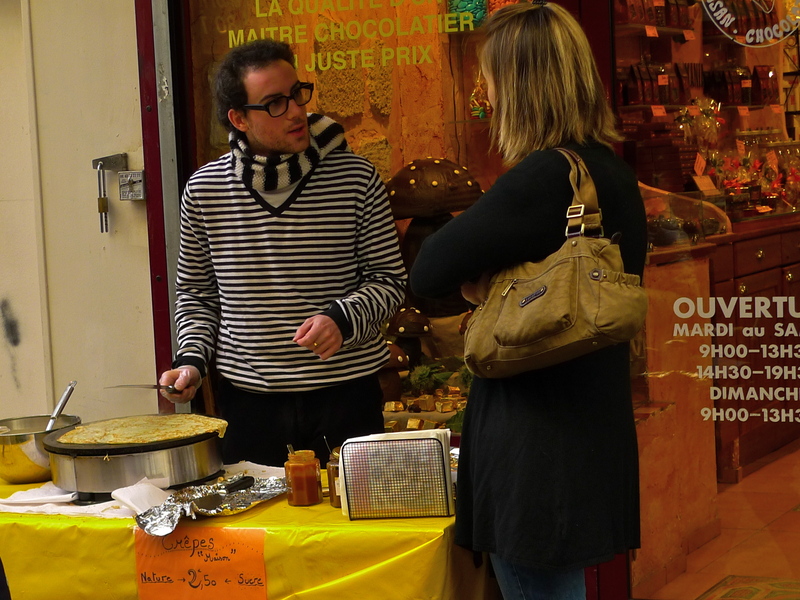 Today, the rue Mouffetard is a street lined with shops, cafés, restaurants and a busy market. It’s a popular place and ideal for a soundwalk. Much has been written about soundwalks and the art of sound walking and I confess that I find most of it impenetrable. It might be simplistic and perhaps unfair to those who toil over such things with such diligence, but I often think that if you have to explain it in great detail, and usually at great length, then you’ve somehow missed the point. To me, soundwalks are simply about observing through active listening; listening to the sounds around us. Sometimes, the sounds around us are significant enough to define a particular place but more often they are simply the transitory sounds that provide the sound tapestry without which a place loses part of its identity. I find soundwalks endlessly fascinating. I love the different textures of the sounds – the chatter of people and snatches of overheard conversations, the transitional sounds from outside to inside and from inside to outside, the clatter of teacups in a busy café, the differing sound texture of the traffic and the captivating sound of footsteps over the pavé. 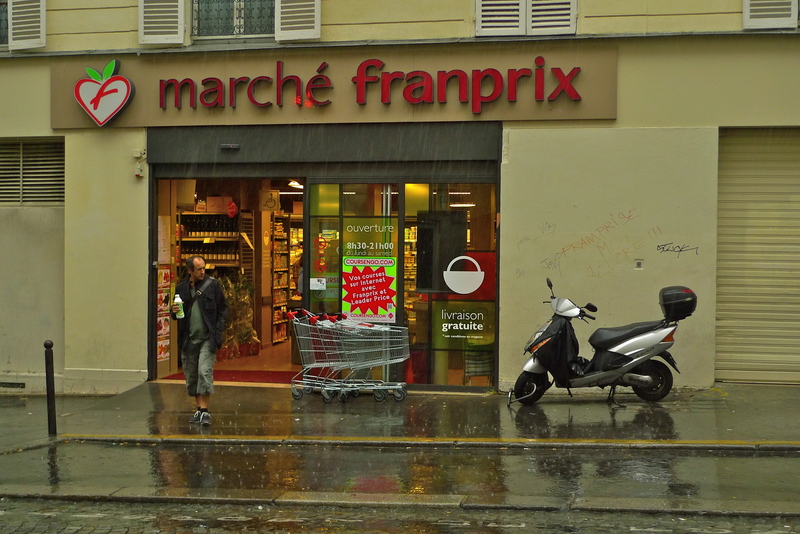 For this soundwalk, I began by sheltering from the rain opposite a Franprix supermarket at the top of rue Mouffetard. 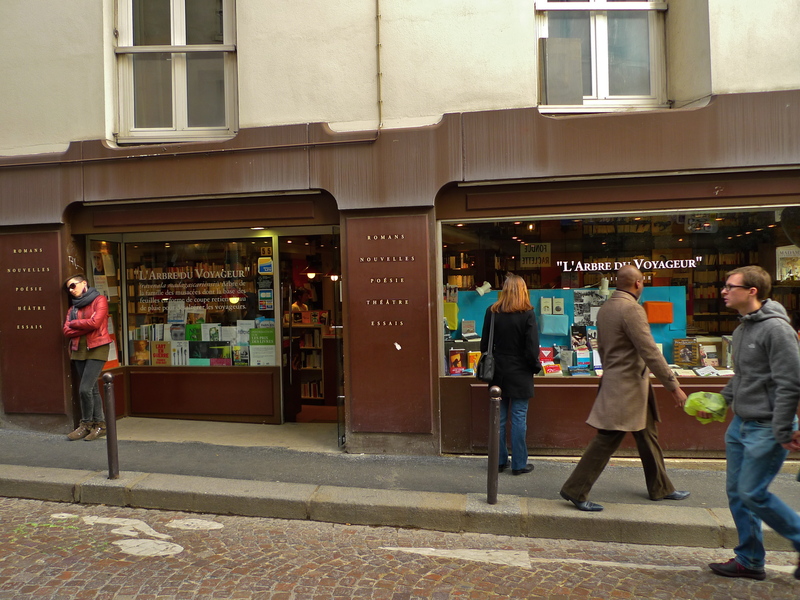 The rain passed and I meandered down the hill calling into the bookshop, a café and another Franprix at the bottom of the hill. The sounds reproduced here are an edited version of my soundwalk which took over an hour. There is no processing or layering of the sounds, so the sounds you hear are the sounds exactly as they were recorded save for reducing a long recording down to a more manageable listening experience of some eight minutes and forty-five seconds. 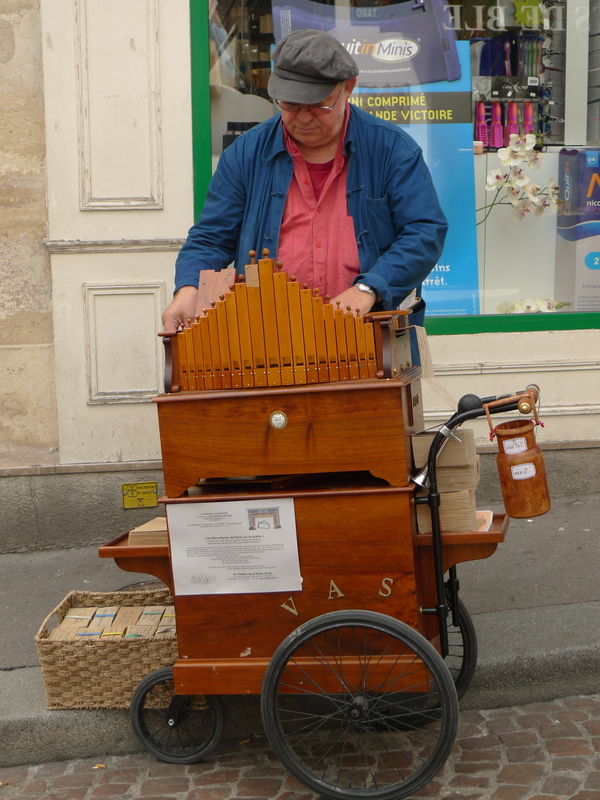 I spend a lot of time walking the streets of Paris hunting for interesting sounds to record. 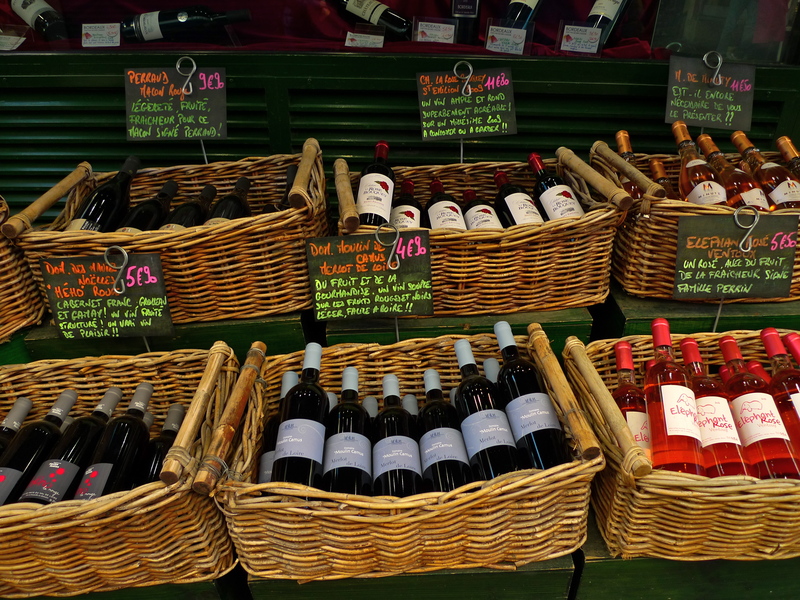 Sometimes I walk in vain – interesting sounds can be an elusive commodity. More often than not finding good sounds to record is a matter of luck rather than expertise – it’s about being in the right place at the right time. My sound hunting wanderings take me all over the city of Paris but there are some streets that I return to again and again, partly because of their history, partly because of their character but mostly because of their atmosphere – rue de la Huchette, rue St Jaques, rue de Lappe and the street I went to yesterday, rue Mouffetard, about which Balzac said, “No neighbourhood of Paris is more horrible and more unknown”. 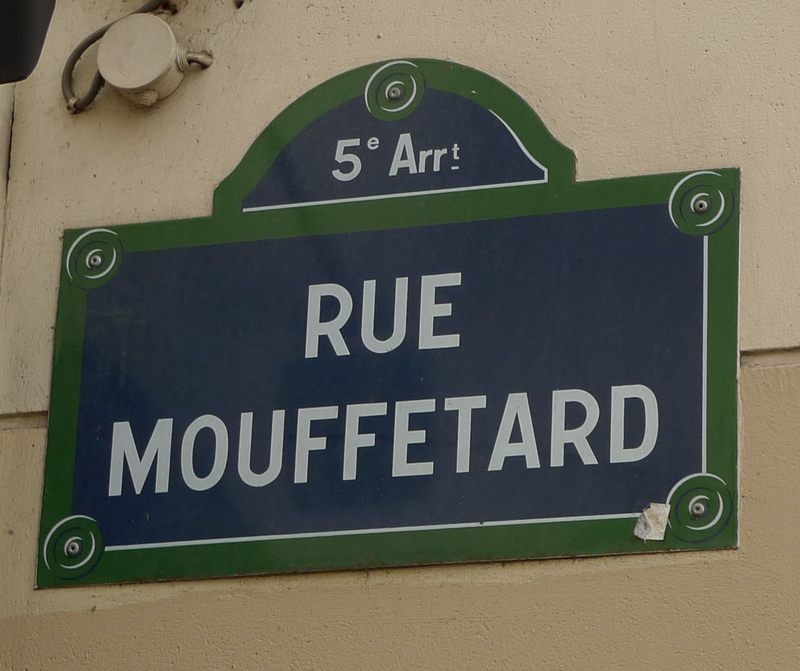 It is true that in Balzac’s day rue Mouffetard had, to put it kindly, a reputation! But it’s reputation today is quite different. It is now a lively, bustling street full of history, character and atmosphere and it just keeps drawing me back time and again. 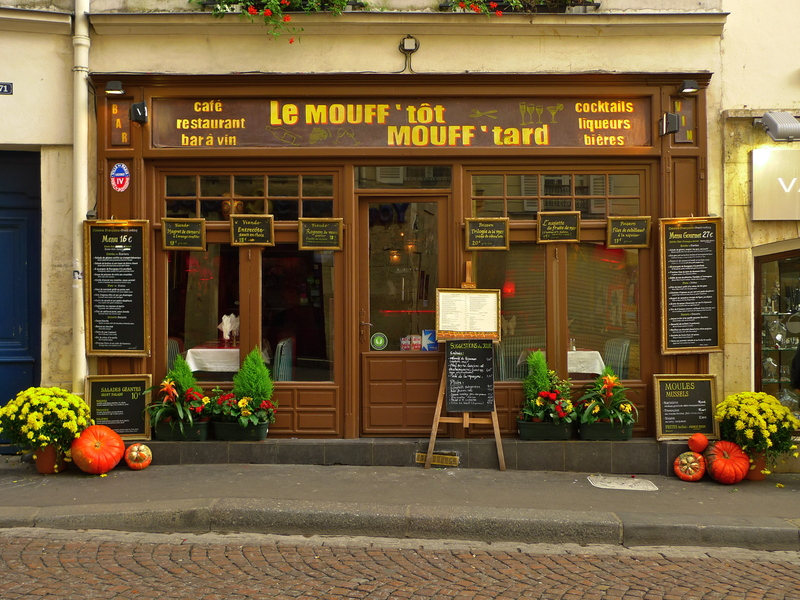 Sitting in the bistro Le Mouffetard last Saturday afternoon with a glass of Leffe and a copy of Le Monde, I was half watching the world go by and half reading the news of terror plots from cargo aircraft, when a sound drifted in through an open window. A three man jazz ensemble had installed themselves across the street and they were just beginning their afternoon’s work. I went to investigate. 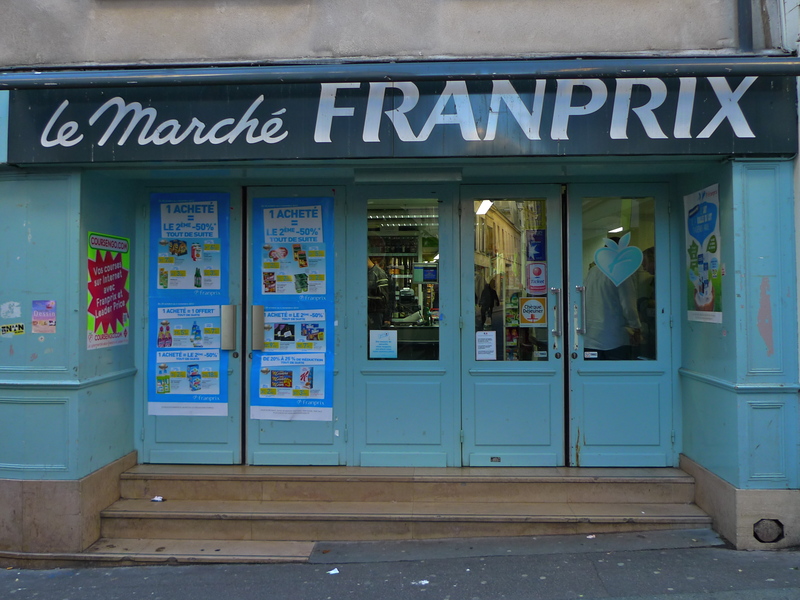 Rue Mouffetard never fails to provide something interesting for this chasseur de son to record. This was one of those elusive moments that comes from being in the right place at the right time. 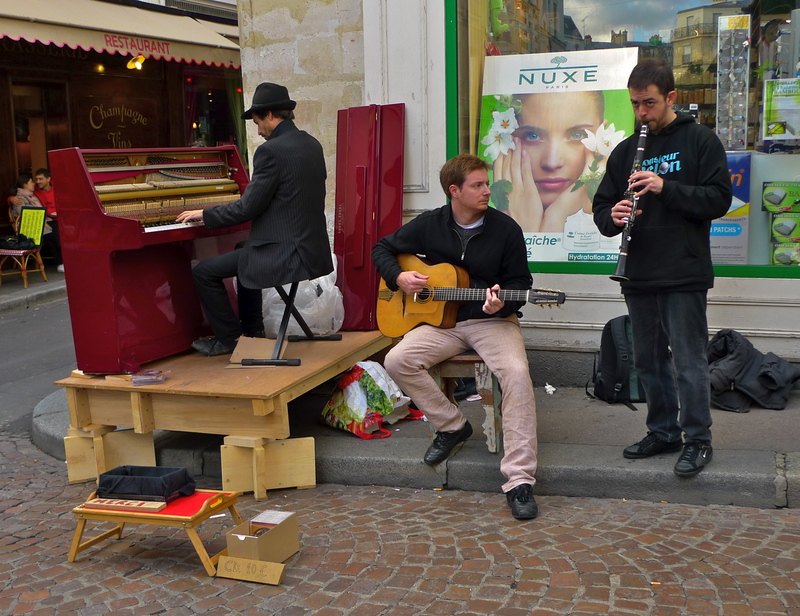 I love watching and listening to street musicians. Invariably, they look to be happy and enjoying their work. 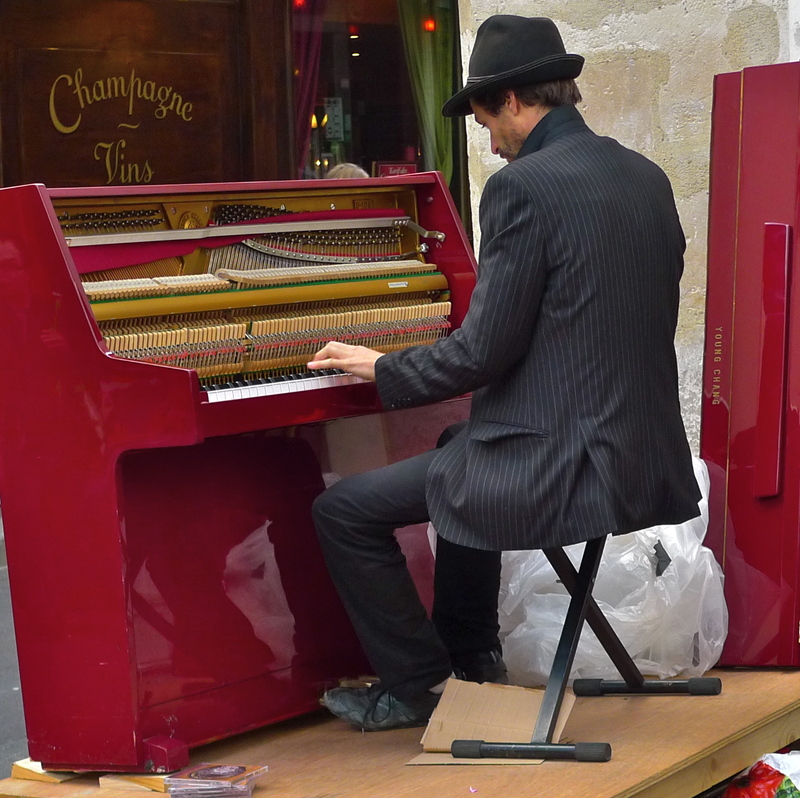 I came across this gentleman recently in the rue Mouffetard. Not only was he making the little organ sing but he was also singing himself. 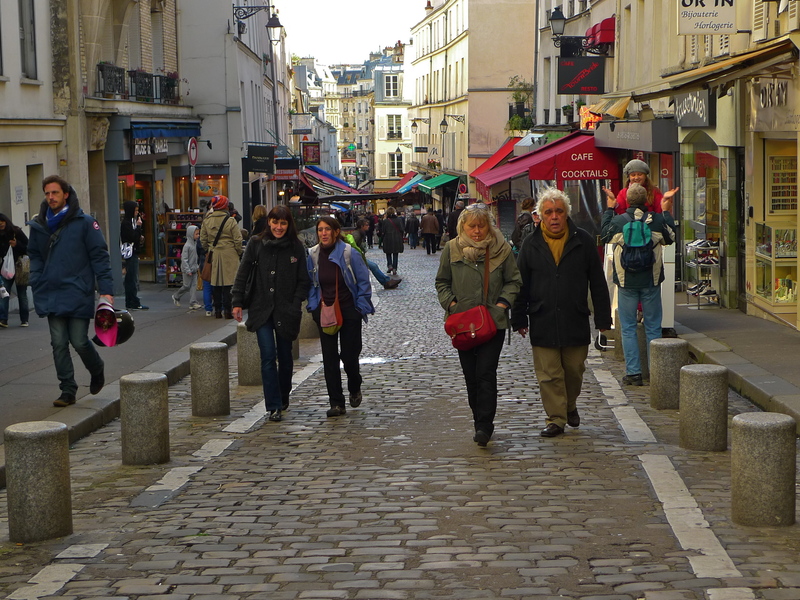 Like the rue de la Huchette and the rue Saint-Jaques, the rue Mouffetard is one of my favourite streets in Paris. Each are hustling, bustling places steeped in history. 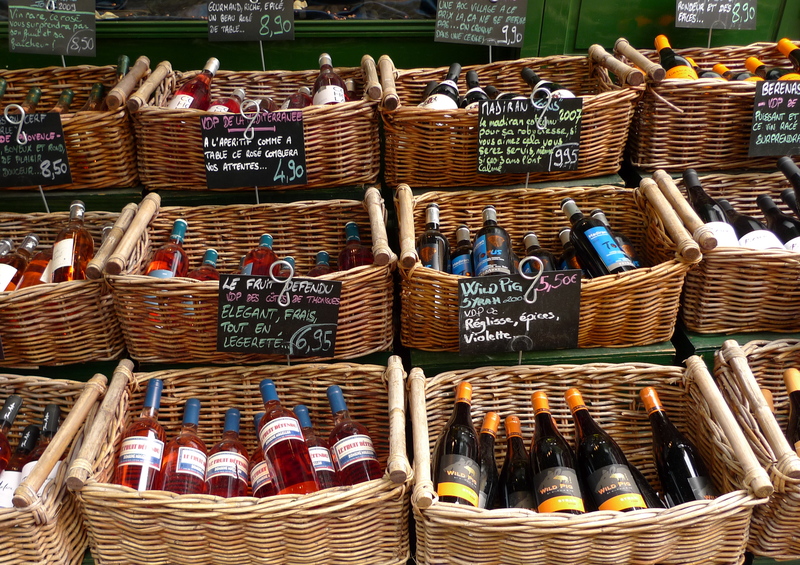 The rue Mouffetard is to be found in the V arrondissement a stone’s throw from the Panthéon and a ten minute walk from the Jardin du Luxembourg. At its northern end, on top of the Mont Sainte-Geneviève, the rue Mouffetard becomes the rue Descartes leading to the Place Contrescarpe. 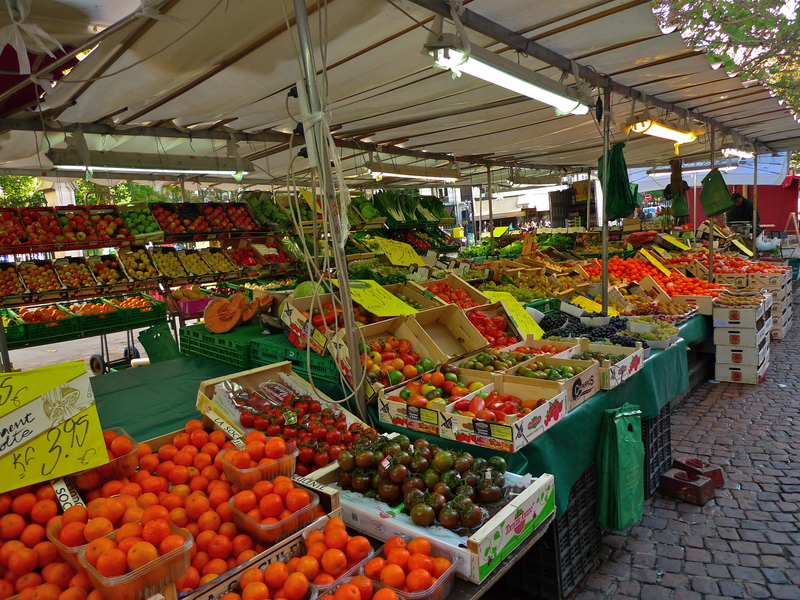 At it’s southern end, at the bottom of the hill, is the Square Saint-Médard where there is a permanent open-air market. It was in this street that I chose to spend my Saturday afternoon. 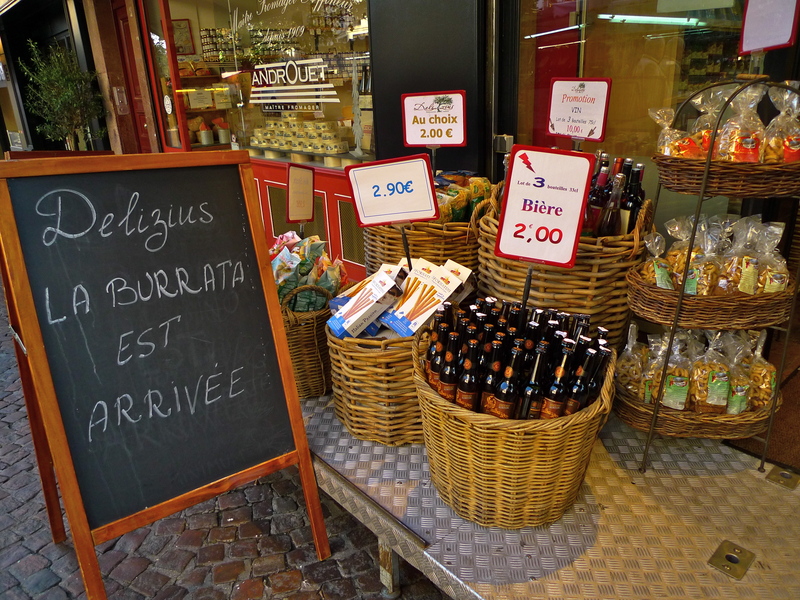 Dating back to Roman Lutetia, the rue Mouffetard as it became was a major Roman thoroughfare which along with rue Galande, rue Lagrange, rue de la Montagne Sainte-Geneviève and rue Descartes, ran from the Roman Rive Gauche city south to Lyon and on to Italy. 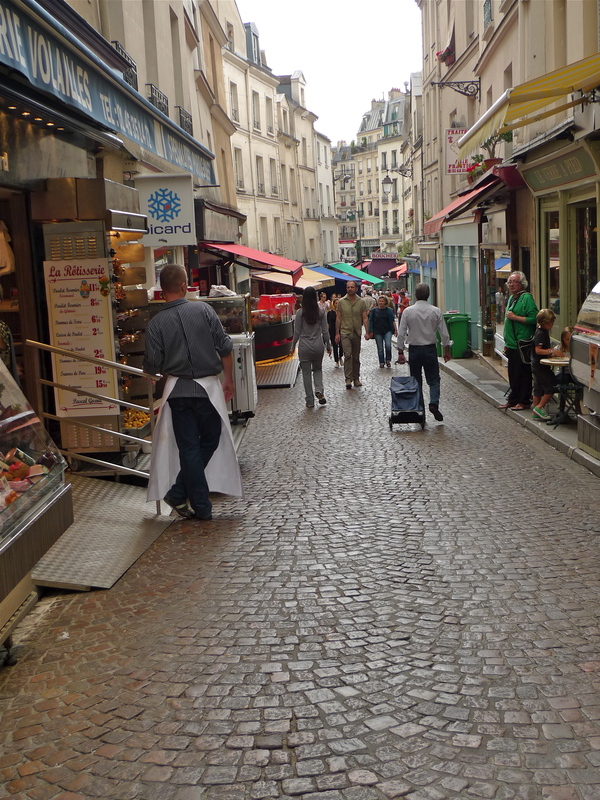 I am pleased to report that the rue Mouffetard is much improved today. 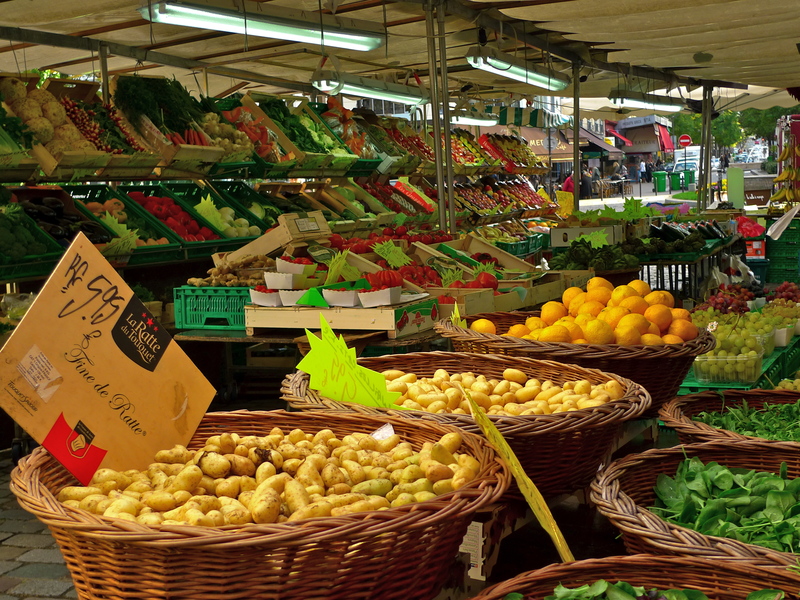 It may be one of the oldest streets in Paris but it is also one of the liveliest with wall-to-wall restaurants, shops, cafés and the daily, open-air market which is one of the oldest street markets in Paris . These are binaural recordings. To get the best effect you should listen using headphones.